teamap.com: Just another tea directory? It’s very time-consuming these days for a retail business to keep up an online presence. It’s not enough — not even close to enough — to have a website. If you really want to promote your business and your brand, you need to worry about Facebook, Twitter, FourSquare, Google Places, Yelp, and whatever industry-specific online directories affect you. If you sell B2B (business-to-business), then you’d better be on social media sites like LinkedIn as well. When I discovered teamap.com, my first thought was that it was just another time sink for me. As I looked into their mobile app and realized its potential for tea lovers, though, I realized we couldn’t afford not to be listed. Now that we’ve been on there for a while, I’ve developed a dual perspective on it: from the point of view of a tea shop, and from the point of view of a consumer who’s traveling and looking for a place for a nice cup of tea. The welcome screen for teamap.com. You’re on the road, traveling in unfamiliar territory and looking for a place to enjoy a cup of your favorite tea. You can fire up your portable computer, go to teamap.com, and enter your destination zip code (or browse by state). 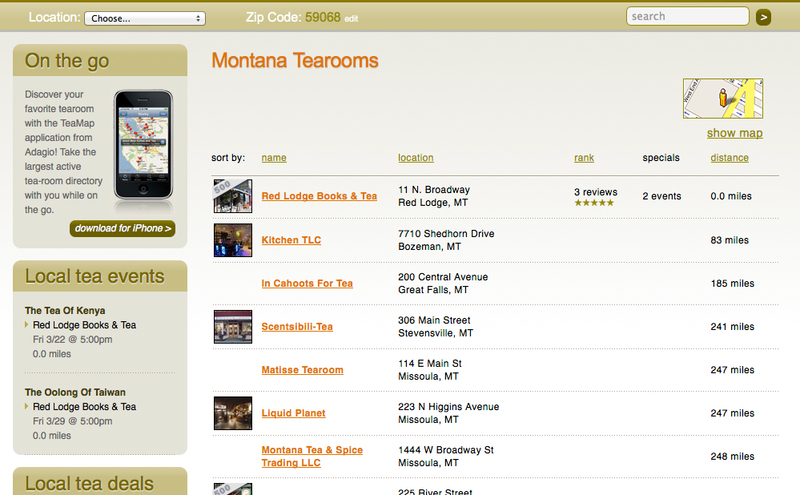 You will get a list of tea shops in the area. If you allow the app access to the GPS on your phone or tablet, just fire it up and it will tell you what shops are nearby, with the distance. A map is a couple of screen taps away. If the tea shop is diligent about it, there will be photos, hours, contact information, website links, and a general description. That should be enough information to decide whether it’s your kind of shop, and to get there if it is. If they have events in the store, the events will be listed as well, and there’s plenty of space for lengthy descriptions of the events. 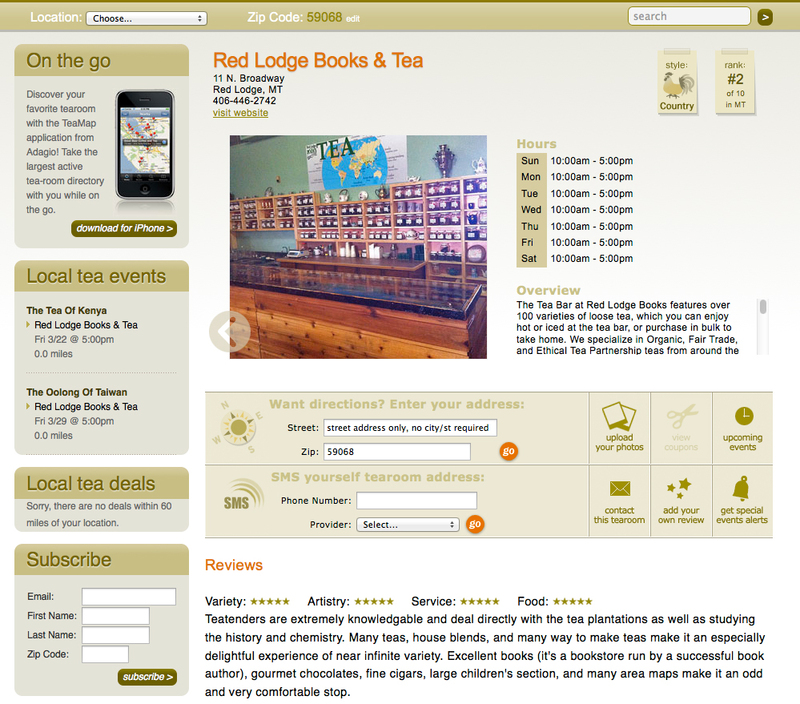 Visitors can leave reviews and ratings, so you can get a good idea of what to expect. There’s no process for removing old data. We wasted quite a bit of time driving to one of the shops on TeaMap only to realize it had closed two years ago. Now we know better, and we’ll call a shop on the phone before driving there. The ranking system they implemented seems pretty arbitrary. I can’t understand what makes one tea shop better than another for them, so I just ignored it (more on ranking below). The app and Web site are a bit buggy. It’s mostly little things: if you use the site to send yourself a text message with the address of the tea shop, you’ll get a long message filled with HTML code and various gobbledegook. It’s pretty hard to find the address in the middle of all of that. Search results based on ZIP code — GPS-based results from the app look similar. Adding a listing is easy. Every single thing I can do to help people discover my tea bar is good. All it takes is a few groups of travelers finding us and telling their friends about us, and whatever time I’ve spent building our listing is well worth it. Unlike some other directories, TeaMap includes links out to our website, which is a big help. Their ranking system is a mystery. There’s a tea shop with no ratings at all that’s ranked higher than mine (rankings don’t appear connected to ratings or reviews). Why is that? If you sell tea and teaware, it’s a bit offputting to have your listing on a competitor’s website (teamap.com is run by Adagio Tea, and ads for their products appear on your listing), but listings are free, so it’s kind of tough to complain about that. Style options are kind of limited (Country, Victorian, Oriental…), and the only way to set one for your shop is to contact Adagio and have them set it for you. Event names can’t exceed 20 characters. It’s tough to give an event a descriptive title in 20 characters. Events have only start times; no end time. Events are text-only; no pictures. Individual tea bar’s info screen. So, is it worth the trouble to create a profile and work on keeping it up to date? I’d say definitely yes. Give it a look. Here’s the link to my tea bar on teamap.com. If you’ve been to the shop, I’d sure appreciate a review. If not, I’d love to have you come and visit. Posted on 21 March 2013, in Tea Biz and tagged Adagio Tea, apps, Facebook, FourSquare, Google Places, GPS, LinkedIn, social networking, teamap.com, Twitter, Yelp. Bookmark the permalink. Leave a comment.